The creative design of this luxurious, handcrafted, Western style bed incorporates a fabulous bench that also serves as the bed´s footboard. 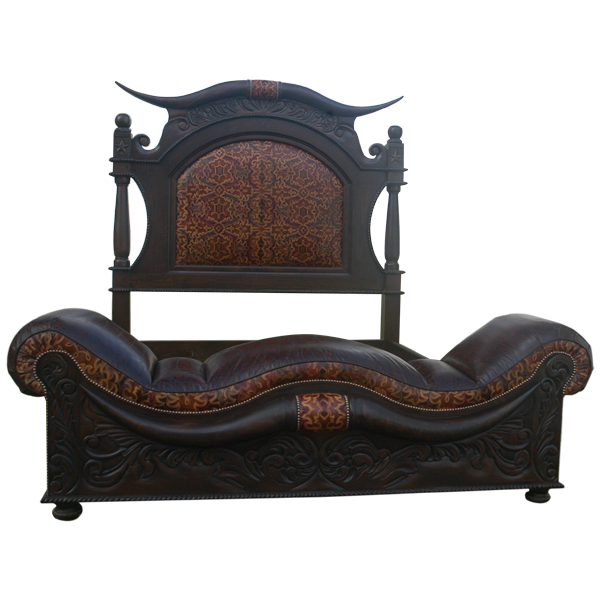 The top of the curved headboard is adorned with magnificent, hand carved horns, and the center of the horns is covered with rich, brown, patterned, full grain leather. The leather is secured with beautiful, gilt nails. Below the horns is a curved, solid wood design, embellished with exquisite, hand carved, floral and scroll details. The front of the headboard has an arched, padded panel, and the panel is covered with matching, brown, patterned, full grain leather. The headboard is framed with elegant, hand turned uprights, and each upright is accented with a hand turned, solid wood sphere and a Texas Lone Star. The footboard is built into a bench, and the seat and the armrests of the bench have an innovative, curved design. The top of the seat, the top of the armrests, and the lateral sides of the bench are upholstered with opulent, black, full grain leather. The front side of the seat and the front of the armrests are covered with brown, patterned, full grain leather, and the leather upholstery is double stitched together for extra strength and durability. The upholstery is also precision hand tacked to the frame with decorative, gilt nails. The front of the bench is adorned with spectacular, hand carved horns that extend to both sides of the bench. The center of the horns is covered with matching, brown, patterned, full grain leather, and the leather is secured with gilt nails. The area below the horns, including the side uprights, are embellished with beautiful, hand carved, floral and scroll designs. The lower base of the bench is enhanced with a hand carved, twist rope design, and the bench rest on lovely, hand turned, bun style feet. The bed has an opulent, dark finish, and it is supported by a solid wood, structural base. It is made with the best, sustainable, solid wood available, and it is 100% customizable.